Home Smartphones Telecoms Smart Announces Samsung Galaxy S6 and Galaxy S6 Edge Data Plans! Smart Announces Samsung Galaxy S6 and Galaxy S6 Edge Data Plans! Filipinos can soon enjoy the all-new Samsung Galaxy S6 and Samsung Galaxy S6 edge smartphones with the best data plans from Smart, which gives them significantly more data volume allowance every month plus exciting perks and freebies for early availers. Users can get their hands on the next-level Samsung Galaxy S6 or S6 edge starting at Plan 999, which already comes with a sizable 5GB of monthly data volume allowance that gives them the Internet for all their needs, plus calls and texts to all networks. 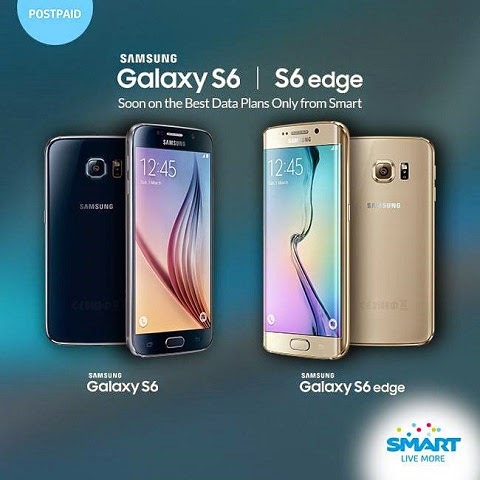 All Philippine telecom firms and retailers will release the Galaxy S6 and S6 edge by mid-April, but interested subscribers can already get first dibs at purchasing any of these two exciting Samsung flagship devices by visiting smart.com.ph/Postpaid/galaxy-s6 today. And a chance to choose one item from a lineup of exciting freebies, including: a Samsung wireless charger, Samsung accessories, tickets to the Katy Perry Prismatic concert, movie tickets, and gift certificates, among many others. Meanwhile, those who will avail of any Samsung Galaxy S6 or S6 edge plan online from today until April 20 will automatically get a FREE Samsung Wireless Charger from Smart. To help them decide which new Samsung flagship smartphone to get, prospective customers can proceed to Smart Stores in the following areas to check out the Galaxy S6 and S6 edge preview kits: Power Plant Mall, Jump Store Megamall, Shangri-La Plaza, SM Dasmarinas, SM Cebu, SM Davao, and SM Baguio. Interested subscribers can get the Samsung Galaxy S6 at Plan 999 with a P19,200.00 cash-out for the 32GB model, or P800.00 a month for 24 months. The Galaxy S6 edge (32GB), meanwhile, is available on Plan 999 with a P24,000.00 cash-out, or P1,000.00 a month for 24 months. This means they only pay P1,799.00 a month for the Galaxy S6 or P1,999.00 a month for the Galaxy S6 edge from Smart. Alternatively, users can get their hands on the Galaxy S6 (32GB) and S6 Edge (32GB) at Plan 2000, with P5,500.00 (P229/mo) and P12,000 .00 (P500.00/mo) cash-out, respectively. But those who want a taste of the premium lifestyle can opt to get these two new Samsung flagship devices with Smart Infinity, Smart’s premium postpaid brand. Both the Galaxy S6 and S6 edge are available at Prestige Plan 5000 and Premium Plan 8000, which comes with a FREE phone plus Mabuhay Miles which can be used for international and domestic flights.